My cousin Brenda and me. She is my best buddy...I am SO glad God brought us back together. Even though Brenda's husband, Chris, was always picking on me...I enjoyed talking to him and spending time with him. He is highly intelligent, and has a great smile and laugh. My Aunt Charlene and me, which is what I've always called her. Everyone else calls her Charley. Aunt Charlene and my daddy. They are half-siblings. Aunt Charlene is a wee bit more than 2 years older than I am. She and I had all kinds of adventures growing up. 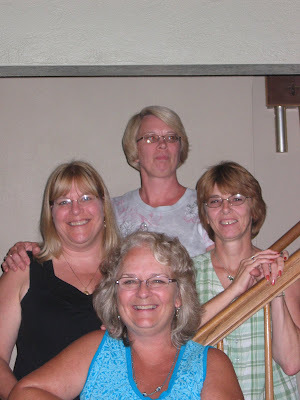 The auntie with her three nieces...In front is Deb, then me, Brenda and then Charlene.